Amazon says it has sold at least 3 million Kindles in the past few weeks. 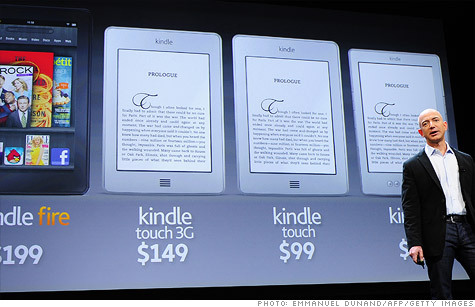 NEW YORK (CNNMoney) -- It's one of the tech industry's greatest guessing games: How many Kindles has Amazon sold? The company has always refused to say -- but on Thursday, it offered its first-ever glimpse into actual sales numbers. "For the third week in a row, customers are purchasing well over 1 million Kindle devices per week," Amazon (AMZN, Fortune 500) crowed on its website. Dating all the way back to the original Kindle's launch in 2007, Amazon has refused to disclose its actual Kindle sales numbers. It instead issues vague press releases referring to each new version as the "fastest-selling ever." For example, in July Amazon announced that the Kindle's "sales growth rate" had tripled since a price cut -- a confusing phrase that led some news outlets to report incorrectly that total Kindle sales had tripled. Amazon's newest statement isn't exactly a model of transparency. The company doesn't break out figures for each different Kindle, which range from its $79 basic Kindle to its new $199 Kindle Fire tablet. The closely watched Fire, which aims to undercut the Apple (AAPL, Fortune 500) iPad, began shipping November 15. Amazon's Thursday announcement hyped the Fire as the "#1 bestselling, most gifted, and most wished for product" -- with no further details. Apple, by contrast, routinely discloses its iPad and other device sales numbers. It sold 11 million iPads last quarter and has sold nearly 40 million since the tablet's 2010 debut. Analysts are closely watching the iPad-vs-Fire horse race to see if Amazon's stripped-down tablet -- priced at less than half of Apple's larger and more advanced device -- will chip away at Apple's sales or tablet market share. At least two analysts have predicted that Amazon could sell 5 million Kindle Fires by the end of the year. Thursday's announcement shows Amazon is on track to hit that target ... maybe. But the Fire has garnered early user complaints about slowness, clunky Internet browsing and more. Earlier this week Amazon promised that a forthcoming operating system update will increase speed, improve touchscreen activity and give users controls over displaying recent browsing activity. That over-the-air update will come within two weeks, an Amazon spokeswoman said. If those improvements can help Amazon can unseat Apple as the tablet king -- or even make a dent -- it will have done better than other power players whose tablets have flopped critically and commercially. Can any non-iPad tablet survive - ever?